The Texas bluebonnet (Lupinus texensis) is an annual flower famous for blanketing Texan hillsides with blue. It's believed the name came from the flower's resemblance to bonnets worn by pioneer women. Bluebonnets thrive in open areas that receive plenty of sun, where the average minimum winter temperatures drops to at least 10 degrees. You can easily plant bluebonnet seeds at home and allow them self-seed each year. Plant your seeds in fall for springtime flowers. Keep in mind it takes a few years to get a good group of bluebonnets growing. Select a planting spot for your bluebonnet seeds that receives full, direct sun. The seeds need light in order to germinate, and mature plants flower best with eight to 10 hours of direct sunlight every day. Bluebonnets are tough plants that can withstand hot, sunny conditions. 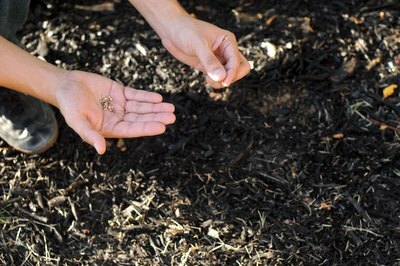 Prepare the soil by raking the area where you plan to put the seeds so the seeds will contact soil. You can prepare a large area or make small spots within other natural vegetation. Bluebonnets are drought-resistant and prefer well-drained soil. If your soil is moist, do not plant the seeds until the first inch of soil is dry. Speed up germination by scarifying your seeds or bluebonnets take a long time to grow. To do this, scratch the seed, slightly breaking the shell before planting. 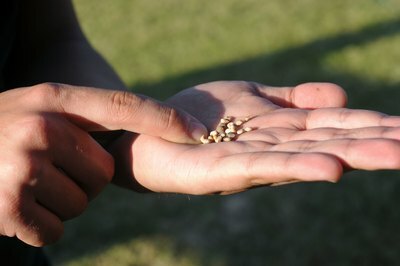 Scarified bluebonnet seeds usually germinate in 10 to 12 days. Scatter the seeds or sow them 10 to 12 inches apart. This gives them plenty of room to grow. You do not need to dig holes. Press seeds slightly into the soil with your hand. Lightly cover seeds with soil so that birds and bugs cannot harm the seed. Water your bluebonnet seeds lightly on the day of planting, but do not water your bluebonnets on a regular basis. You should not have to water them except on the day you plant. 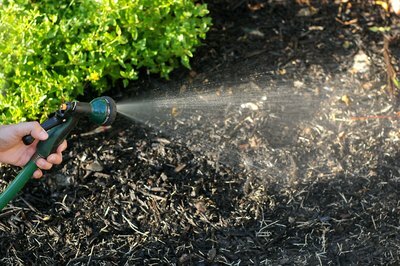 If fall or winter rain or snow is low, then you can lightly water the seeds. Snow does not harm the bluebonnet because it doesn't bloom until later. The winter growth helps it build a strong root system. How Long Do Bluebonnets Last?